Vase is in excellent condition, no flaws. Dimensions: 250 mm height, 68 mm diameter. 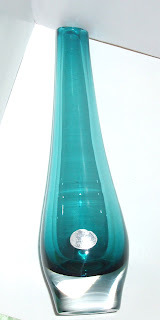 A crystal vase sommerso (colored crystal layer is coated in another layer of crystal clear) made manually, for the prestigious brand Orrefors, Sweden, by one of the most renowned glass artists, Goran Warff. The vase is signed on the bottom - wf of 5614-250 - ie Warff, Orrefors and model number. Keep the original label Orrefors. Therefore talk about a piece of collection, identified, signed, labeled, with a market average price somewhere between 60 and 70 USD. Browse similar products using CRYSTAL VASE ORREFORS GORAN WARFF - to get an idea on price. I left a very large margin (about 100%) for the buyer.